I am back! Sorry for not posting last week, but Monday was pretty much a blur to me. We arrived home from California very late Sunday, or very early Monday, however you want to look at it, and I honestly don't remember doing anything on Monday! Our trip was amazing! I managed to get some workouts in so I could indulge in the many eating and drinking activities we crammed into five days. If anyone needs suggestions for lodging or dining in Yountville, Monterey, Carmel or San Francisco, message me. When I was single my refrigerator looked like the stereotypical single person’s fridge. It contained minimal food; mostly cheese, a vegetable, beer and a bottle of white wine. I ate out a lot. That may sound unhealthy, but I managed restaurants so I ate at the restaurant where I was working. I controlled what went in my food, and, most importantly, I got to learn from the chefs I worked with. The great thing about cooking in a restaurant kitchen is everything is prepped and ready to go. So cooking for one person is very easy. If I wanted to make a meal at home I would go “shopping” on the line in the kitchen. I could grab a handful of this and that, take it home, cook it up and never worry about leftovers. It drives me a little nuts when I go to the supermarket now and the only price break is on bulk products. There are only two of us! What am I going to do with a 4 pound bag of lettuce?! I have the same problem with recipes. They are often designed to feed 4-6 people. Luckily, I married someone who loves leftovers! It is still a challenge, however, if I want to make something small or it is something that does not keep very well. One example is stuffed squash. Acorn squash is often served stuffed. I find them to be quite large, though, and therefore just too much food. Cutting them in half is a good solution to this dilemma. Rather than cutting off the top of two acorns and hollowing out the middles, I cut from stem to stern to create two “boats” out of one squash, shave a little off the sides to make a flat surface, and then stuff it with some yummy combination of grain, veggie and protein. I do the same with peppers. One pepper is often too much for us to eat individually. Cutting one pepper in half the same way as the acorn squash is usually just right. I serve them with a tossed salad and dinner is just the right size. One of my favorite squashes is butternut. I love it served the traditional way of roasting, scooping and mashing with brown sugar and butter. But I am always open to trying new methods. I never thought about stuffing them simply because they are even larger than acorn squash. So I was thrilled when I went to Wegman's and found a new type called honey nut. It looks like a small, squat butternut squash. The one I bought was about the length of my hand. I did a quick Internet search for recipes and came up with two possibilities. One was to make it into a pasta sauce. This involved sautéing and blending. It looked fabulous! The other was to bake it and then stuff it and bake again. That was the one I opted for since we had recently had pasta for dinner. Today’s recipe is my version of twice baked honey nut squash. I stuffed the squash with wild rice, mashed chickpeas, broccoli and feta, only a handful of each ingredient. My guideline is usually about a half cup of each ingredient and half that (a quarter cup) of “richer” ingredients, such as cheese or nuts. I find this provides more than enough filling. As far as buying small amounts, farmers markets are a great resource. I also shop at Wegman's where I can fill produce bags with a small amount of mushrooms, broccoli, potatoes, etc. You don’t get the price break you get on family packs, but I also don't waste a lot of food. Anyone have other ideas when making smaller meals? Share with us in the comment section below! Okay, on to the recipe! Stuffed squash or peppers are an excellent way to clean out your cabinets or fridge! This recipe reflects what I had on hand last week. Next time it might be a combination of quinoa, red beans, mushrooms and cheddar. Another time it might be couscous, white beans, brussel sprouts and chopped walnuts. I encourage you to use my recipes as a jumping off place and make them your own by adding your favorite ingredients. That might even include meat! I watched the chefs at the restaurants I worked at to get ideas. Then I would create my own meal. I hope you do the same with my meals! You can also double this recipe if you have more than two people to feed. It makes an awesome entree for company. Preheat oven to 450 degrees. Spray a ceramic baking dish, large enough to hold the squash, with cooking spray. Place rice, broth and butter (if using) in small sauce pan. Bring to a boil, cover, reduce heat to simmer and cook for 40-45 minutes, until liquid is absorbed. Brush squash with 1/2 tablespoon of olive oil on both sides, and place in prepared dish, cut side down. Place in oven and bake for 20-30 minutes, checking for doneness by piercing thickest part with a sharp knife. Remove from oven and careful scoop some squash out, and set aside. This will create a larger cavity to stuff, but leave skin intact. Put shells back in baking dish, cut side up. Reduce oven to 350 degrees. Meanwhile, heat remaining tablespoon of oil in sauté pan over medium heat. Add onion and cook until translucent, about 5-8 minutes. Add garlic and cook, stirring frequently, for one minute. Add broccoli and cook until softened, about 5-8 more minutes. Remove from heat. In medium size bowl, gently mash chickpeas with a fork or potato masher. Stir in squash you scooped out, basil, vinegar, broccoli mixture, wild rice, half of the feta, and salt and pepper. 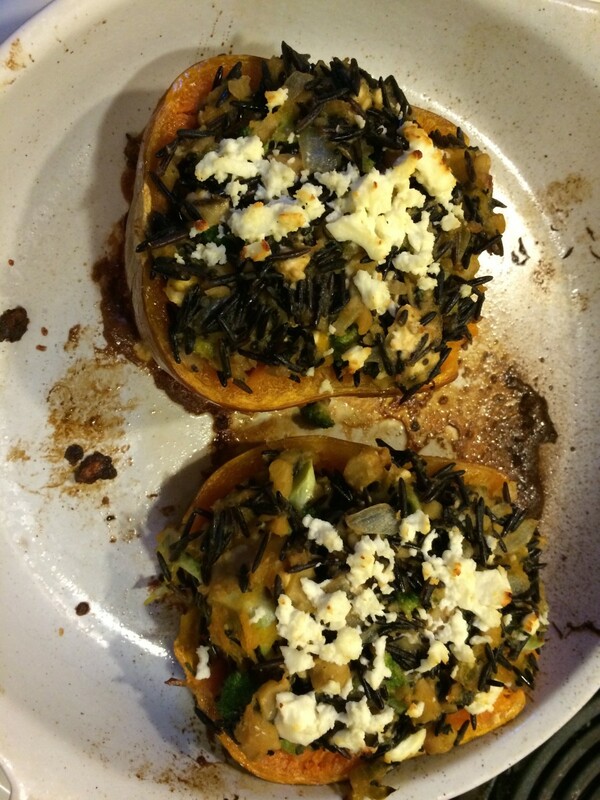 Stuff into squash shells and top with remaining feta. Return to oven and cook 15-20 minutes, until filling is hot. (I listen for sizzling). 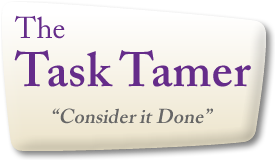 Copyright © 2019 The Task Tamer. All Rights Reserved.